Find out how we create beautiful pieces of artful comfort for your home, with a word from our founder, John Wyma. From the farm, the wool is scoured (thoroughly washed) to remove the grease, dust, dirt and then dried. A lot of the natural oils are retained in the fibre, which gives natural wool the unique insulation quality it is famous for. The loose wool is then carded (combed out) and divided up in to “slivers”. From there the slivers can be divided up again, or different ones mixed together and the spun (twisted) into individual threads. These threads can then be used individually or plied together to make thicker yarn. Most of CRONZ carpet is stock (loose wool dyed) and can be dyed at the stage it is scoured. For our rugs the wool is dyed in smaller batches after spinning, so hank dyed. Hank dying in smaller batches allows us the ability to incorporate a variety of colours, some of them specifically developed for a client, into one project. The wool is dyed in large vats at around 90 C. The amount of dye required is worked out in the lab on a small sample before the main dying starts, so colour accuracy is attained for the larger amount of wool. Dying the wool and yarn is a very complex and delicate process, requiring patience and a good brain! All the machines were designed and built by us from the ground up, including all the mechanical, electrical, and much of the programming. We hank dye in smaller batches to offer our clients variety and flexibility, so we need to prepare the wool for the machine by winding it onto a cone. 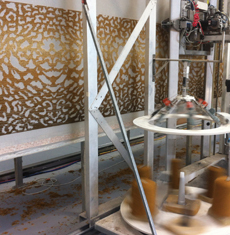 During this process, the colours are combined, allowing for controlled even distribution of multiple threads. The next machine designed and built in-house by John Wyma, is the tufting machine. Tufting is historically done by hand, positioning a gun where the yarn is to be tufted in the desired direction. This is very labour intensive, costly and often connected to unethical work conditions. John wanted the same result as a hand tuft look, in an economical and ethical way, combining the infinite versatility and flexibility of the handmade with the quality consistency that comes from mechanical control. Various generations of the initial design concept later, the tutting machine can now tuft in multiple directions, carry various colours simultaneously and produce a controlled design down to the millimetre. Most rugs and carpet require hand sheering . This process removes the slightly longer yarn in certain areas, and gives a divine, smooth velvety finish where the pile height is all the same length. Nothing finishes it quite so well as the human eye and hand. What does the weight mean? The wool is spun into different “counts” or weight per meter. For carpet yarn we call it 'Tex', which is the measure of weight per 1000 meters e.g a 400 tex yarn would weigh 400 grams per 1000 m (or 4 grams /meter). From there, based on the style/pile height/stitch and row gauge we can work out the weight of yarn required. The yarn weights vary from 1.5 kg/m2 to 6kg/m2.